Let Your Living Situation Point The Way. Choosing a weed stash box should be like choosing a phone app. It’s more about what it does, and less about how it looks. Your first priority is always its features – do they work for you? It’s great if it also looks cool, but to get on your phone, it had better do something you really want or need. The same can be said for choosing a weed stash box. You can’t just shop for one like they were shoes. To choose a stash box that best fits your needs, look at its features and compare them against your living situation. Ask yourself who else is at home and therefore, who else will be around the box – even if they’re only visitors. And it’s not just who’s around the box, it’s how they behave. More than anything else, having a clear sense about everyone’s behavior will help you choose the right stash container. Think of it this way, the cannabis goodies you keep in the box is for you. But the stash box itself is for everyone else. And that’s the essence of this entire article: How to choose a weed stash box to best match the needs of your living situation. At the most basic level, all stash boxes are designed to protect the cannabis in them from the elements – like light, moisture, heat, and air. Beyond that, the right weed stash box will protect children from your cannabis, or your cannabis from other people, or your privacy from judgment and scrutiny. Because it really is the people (or kids) and any uncomfortable or challenging tendencies they may have that will tell you how careful you need to be about storing cannabis at home. The better everyone behaves, the more relaxed you can be about protecting your stash. And “everyone” means every single person – an adult, a teen or a college-age minor. If there were 100 people in the room around your stash box and 99 were angels but the last one was not. It’s that last person’s behaviors that would decide for you what kind of box you need – in this case one that locks or hides and locks. There are 5 different kinds of weed stash boxes. And as I’ve said, each one is meant for a different living situation – that is, who else is there in your home. If you know someone who has a stash box, no matter how much they might rave about it, don’t automatically assume the same kind will work for you. This box is intended for those who have only adults living or visiting who can be trusted completely. These boxes are usually made with furniture-quality finish and touches and typically features an easy open lid held shut with strong magnets or a shiny metal latch. The size varies from those that are small enough to fit in your hand, to about the size of a small toaster. You can opt for this kind of box when you only have adults at home but for whatever reason you still feel some need to lock it – perhaps you’re not always home and someone brings friends over. Everyone who lives there knows you have a stash of cannabis in that nice looking box. But no one would ever think to break the lock to get at it. It’s just not the done thing. Another kind of stash box is disguised to look like a book. Which means it blends in perfectly when you set it up with the other books on a shelf. This is an extremely effective disguise because the cover design looks dated and generally uninteresting. Because you know the secret, you’d notice this book box immediately. Because it blends in, no one else would see it. Essentially, it doesn’t exist. Not only are these boxes big enough to keep all your cannabis and goodies in one place, but they’re also meant to live high up on a bookshelf way out of reach. And that makes them great at keeping your cannabis goodies away from the really small kids. But you will have to remember to get the next item we’ll cover – a locking book stash box – later when any of the kids are about 6 years old. That’s the age when kids start to really explore around the house. Besides being a great way to keep your stash away from kids, a book box is also amazing for protecting your privacy. For exactly the same reasons the book box stays off the radar for kids, it will also go unnoticed by anyone you don’t want to realize you keep a stash in the house (or room). The next level up from just concealing your stash is another book box design that will also lock it up. There are three reasons to consider this option: You should think about getting a lockable book box if it’s going to be hard to keep the book box a secret. If your living situation is full of people who are always around at the house or your room, unless you’re super careful, they’re eventually going to know you have a stash. Chances are still slim, but they might find your book box. The lock should keep them out of it. Lastly, a lockable stash box is a great personal storage option for cash, jewelry and other valuables small enough to fit in it. I’ll talk later about stash box disguises and what makes a good one and what does not. The last kind of stash container is an in-your-face, complete lockdown, digital combination, steel safe. Someone’s behaviors will lead you to make this choice. By them getting into your cannabis (or that you expect they will if they can find it), you’re left with no choice other than enforcing your boundaries. And if that’s your reality, then this is an inexpensive way to put a stop to the pilfering and have some peace of mind. So that’s the quick sketch, but you should follow along because there are a lot more details, best practices and great tips you should know. Taking the right approach to choosing a stash box with your situation in mind, is everything. Only The Lucky Ones On Our List Get The Best Prices. Leave your email and get invited to private sales for the best stash gear like this Silverton with a scent-proof zipper and a digital combination lock. We completely respect your privacy and you can unsubscribe at any time. For most people, having cannabis in the home is a relatively new experience. Across the country, “we the people” have been voting in favor of making it legal. At last count, 30 states have legalized medical cannabis and 9 states are fully legal. And more states are expected to take similar steps soon. So a lot more people are legally buying it and bringing it home – often for the first time. And there’s the rub: once they get it home, how are they protecting it? How you store your cannabis is everything. When people come home with their fresh herb, where do they typically put it? As if almost a reflex, they resort to the same private spaces: a top shelf in a closet or in a dresser drawer. Both of which are in the bedroom and are often the first place anyone who’s inclined to look for your stash would think to search. Moreover, people often do nothing to secure their purchase. Instead, they just leave their cannabis in the original paper bag from the dispensary. So neither your stash nor any minors who might visit or live in your home are very well protected from it. Even if you’ve been bringing cannabis home for years, chances are, you store it in exactly the same way. That might be okay if you’re completely alone 100% of the time. Trouble is, that’s seldom the case. There are occasionally people who arrive at your home to deliver new furniture, install drapes, or clean the carpets – whatever. And then they might be standing near that drawer or walk by that closet. Chances are, they’ll notice that very distinctive scent of cannabis. Your stash is practically announcing itself with flashing neon arrows. So why even bother hiding it? And thus why you need something specifically designed to store cannabis. Enter the weed stash box. We have a weed stash box design that will work in any situation. In the sections that follow, I cover a wide range of living situations and then I’ll pair each one with the best stash box to fit each need. Some situations are a risk to privacy, and other situations make protecting minors a priority. Still, other living situations call for hardened boundaries like a metal safe. Or a few situations are so casual and trusting that there’s no need to protect anything at all. Use our Stash Box Chooser App” and in 3 clicks or less, it will point you to the weed stash box that will truly work for your situation. And then tell you why. Each situation is unique and calls for a different kind of box. To find your situation and see what box works best, you can follow along and read this article. Or you can skip to the good stuff in just three clicks. Just for the sake of “cutting to the chase,” we’ve made finding the best weed stash box for you super easy. Just click the yellow box to the right to get started – nothing to download – it just pops up right here in your browser. Or read on as I cover the various living circumstances most people can relate to and how I pair each one with the best weed stash box. Who (family and/or friends) visits or lives in your home? Would anyone likely to get into your stash of cannabis if they found it? Do all the adults visiting or living at your place completely respect your boundaries? Is there someone around who should never learn that you have cannabis? Are there kids of any age either living or visiting? If there are any minors around, are any old enough to use tools to break into a locked box? No matter what your situation, we have the perfect stash box to help protect what’s important to you. 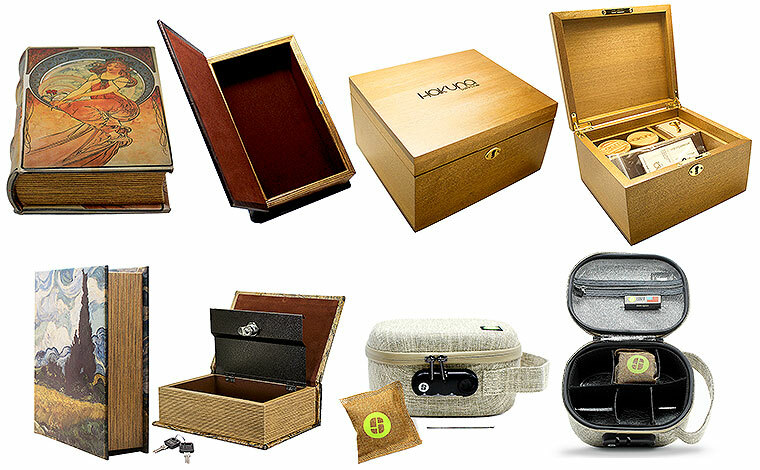 We offer a variety of great-looking, well-crafted stash boxes that will easily last for years. As I mentioned, no matter what else our stash boxes are designed to do, they will all protect your cannabis. They each seal your cannabis in a light-proof container and lock in the scent. From there, some of our stash box designs are meant to be set out on display, others hide in plain sight. Some are lockable, and others are any combination of the display/conceal – lock/no-lock features. Laser Engraved “Sea Turtle” Design, Black Lacquer Finish, Removable Dividers and Magnetic Lid. If you completely trust all your adult housemates – and adult visitors – to observe your boundaries, AND there are no minors worry about, then choosing the best stash box will be super easy. Virtually any of our stash box items will work for your happy situation. I suggest you get one of our very classy display-quality wooden stash boxes that have no lock. Not only are these boxes very stylish, but they also don’t really offer any clues as to what they contain. Yes, they’re easy to open, but they don’t really draw any undue attention. How to keep your housemates out of your stash box while you’re away? Don’t encourage them to get into it while you’re home. Getting into your box becomes a mindset. It’s easy while you’re gone for someone to think “Oh, he/she won’t mind,” and help themselves. And by setting your stash box it out unprotected, it sets an interesting tone for the house, one based on trust. But even if you have well-behaved housemates, there’s a tip to keep them honest: don’t let anyone get used to reaching into your stash box – even with your permission. If someone gets used to reaching into your stash box, and you’re not home, it’s a very small step for them to think “Oh, well, they won’t really mind…” and start out pulling your goodies. Just keep it light but firm – only you reach into your stash box. The people who visit or live at your house are nice enough, and if the moment seems right, you might share your stash goodies. But no matter how nice your housemates are, you still have some reason (whatever that may be) to be careful. And you’d never leave your cannabis out for just anyone to see. Nor would you ever let anyone know where you keep it. But chances are, the place you’re hiding your stash is not really that original: in your bedroom, stuffed it in a closet or a drawer. The stash book box I’m suggesting should not be a surprise. This storage option covers a lot of situations where one needs to conceal their stash. So instead of hiding your stash in the first place anyone typically looks, keep it somewhere completely unexpected. The best reason to get something new that looks old? This book works so well because it appears to be worth nothing, uninteresting and mindlessly left up on a shelf. And we chose the cover designs so they look out-dated and bland. They just simply blend in with your other books. It’s the paradox – hide something by setting it out in plain sight. That’s what makes our book boxes perfect for hiding your valuable stash. They’re each designed for a lot of situations where you don’t want your stash container to attract any attention. That makes our stash book boxes perfect to keep your stash completely off the radar for whatever reason your situation calls for. Maybe you need to protect your privacy from visiting family members who feel free to wander around your place. Conceal your cannabis in one of these boxes and no family member will ever find it. And if you don’t know how your people feel about weed, having them discover yours is a very risky way to find out. Keeping your stash off the radar is especially important if one of those anti-cannabis people happens to be your crusty landlord. A book box could save you from the landlord ending your lease and tossing you out. The law won’t be in your favor if you signed the lease with that “no marijuana allowed” clause spelled out. Once your stash is tucked away in a book box and you set that way up in a bookshelf, the box and the stash in it will just disappear. When you walk into the room, you may notice that book box because you know the secret. But to everyone else, including your landlord, the book simply doesn’t exist. Perfect. Our book stash boxes have faux leather covers with an eclectic mix of low-key, classic designs and plenty of room for all your personal stash and other goodies. Designed with a powerful magnet to hold the lid shut or a key-lockable option, these book boxes are well made and certain to last you for years. These book boxes are inexpensive, super effective and built to last for years. Take a look at the choices here and pick one up. You’ve discovered someone in your home is raiding your stash of cannabis – and on a regular basis. So what to do? Get barbed wire and guard dogs? If you want the peace of mind from knowing that nobody, not your roommate or their sketchy friends (or anyone else) will ever get into your cannabis again, then I think this small $39 digital combination safe is an amazing value. Think of it as your own personal Fort Knox. The people who make this compact combination safe never originally intended it to be a cannabis stash box. But that’s only because they didn’t think of it first. It’s the perfect size with the right amount of security hardware to protect your goodies from anyone in your house who really just needs to go buy their own cannabis. With solid steel construction, it’s big enough to protect your personal stash of cannabis, accessories, and other goodies, yet small enough to fit nearly anywhere. It comes with backup keys and the hardware you need to anchor it securely to a wall – so someone can’t just walk away with it. Besides, it’s a lot cheaper than a guard dog and you don’t have to feed it. Keeping your stash away from children this young is just common sense – keep it way up out of reach. But kids grow fast and all too soon, they’ll be old enough to start getting into everyone’s things – including yours. Knowing that, you should plan ahead and choose a stash box that’ll not only avoid drawing their attention, it’s also lockable. So if by some very, very slim chance they ever do find your stash box, they can’t open it. This describes one of our “hide-in-plain-sight” locking book stash boxes. We make each one with faux leather covers and an eclectic mix of low-key classic designs and plenty of room for all your personal stash and goodies. When children are around, even if they only visit, it’s all the more critical to keep your goodies up and out of reach. Especially if your stash includes any cannabis-infused edibles like candies or chocolates. Do not rely on child-proof packaging to keep them safe. The packaging may work and then it may not. Children in kindergarten are taught how to use scissors. It’s easy to imagine that if a child got to a stash of edibles, they will eat as much as they can without stopping. And that will be a 911 call, followed by a lot of hard questions from some very serious people with difficult legal issues soon after. Be so super careful with your edibles. There is just no room for error and no forgiveness. When you order a stash box, it arrives as a secret. Only you know that it exists and what it looks like. And everything you do from that moment on should be geared towards keeping it that way. Good habits are helpful. Habits like waiting until you’re alone to handle the box (including when you first take it out of the shipping carton). One of the most important things about having a stash box that’s hiding in plain sight – especially around the kids – don’t do anything to draw their attention to it. Don’t indicate somehow that it’s interesting or important to you. Leave it alone until you’re alone. The four simple stash book box rules when minors are in the house. 1. ALWAYS set your book box on a top shelf with other books. 2. ALWAYS wait until you’re alone before getting it down. 3. ALWAYS lock and put your box back the moment you’re done. And once you start using your new stash box, the only way it will stay a secret and hold it’s disguise is if you never tell anyone about it. Never let anyone – adult or minor – see you reach for it, see you holding it or getting into it – period. Only have it off the shelf and open just long enough to get what you need. Then lock it (if it’s lockable) and put it back. Never make anyone – especially your kids – aware of your stash box, where you keep it or how to get into it. You should simply behave as though your stash box doesn’t exist. Beyond that, set your book box up where it has the best chance to blend in. A bookshelf with (of course) other books – preferably other old books. If you need to, go to a Goodwill store and get about a dozen inexpensive old books that are about the same size. Then the chances of anyone taking notice of your book stash box would be extremely low – almost like a bolt of lightning might find it first. When you have minors visiting or living with you who are old enough to be gifted at exploring every corner of your house (meaning getting into all your things) then you have reason to be super careful how you store your stash. If you’re not particular where you store your cannabis and have it in some baggie stuffed in a closet, then the kids will eventually find it. Or, if your kids are old enough to be asking for the car keys, not only are they old enough to find your stash, they’re old enough to get past a simple lock. So it’s time to be proactive and get in front of that. The best answer is to put your cannabis stash on complete lockdown. If you want the peace of mind from knowing that no one, not your teens or their friends (or anyone else) can ever get into your cannabis, then this small $39 digital combination safe is an amazing value. Like I mentioned above, the people who make this compact combination safe never originally intended it to be a cannabis stash box. But that’s only because they didn’t think of it first. It’s the perfect size with the right amount of security hardware to protect your goodies from anyone in your house – all at a great price. If you prefer to keep your stash box a secret – even from some people, never show it to anyone. Over time, word can drift around. And there’s no such thing as a secret that everybody knows. It comes with backup keys and the hardware you need to anchor it securely to a wall. That way someone can’t just walk away with it. So whatever the age, you no longer have to worry when the kids find your safe. Okay, we’re really not encouraging you to lie. But remember, you don’t have to tell them anything about the safe or what’s in it – just because they found it. Having cannabis tucked away in a stash box at home is great. But that can be cumbersome to pack and doesn’t really travel well. If you’re on the go and want to take you bud with you, I suggest a locking and scent-resistant item that’s both a weed stash box and a travel stash bag. So while you’re home, you can use it to keep your stash locked and up out of sight (if you need to). Then you can grab it when you’re flying out the door to go visit a friend or packing a larger bag for the road. We offer a number of travel stash bag options (see below). The one I’m featuring here is The Silverton Hardshell Linen Travel stash bag from Stashlogix. It’s specially designed to not draw attention and blend in with a low-key appearance. But take a closer look and you’ll see some the many advanced features that make it ideal for securing and discreetly carrying your stash out in public. Travel with no more than your legal ounce of cannabis and know the laws in your destination state. If you’re flying, only the laws in destination state matter. But if you’re on the road, abide by all the cannabis laws in each state you travel through as well. Here’s a Quick Reference for current cannabis laws. In addition to the hard-shell case, the interior is lined with an easy to clean silver-foil inner layer. Along with the rubber seal zipper, that lining helps to seal in the lovely fragrance of cannabis as well as makes it moisture and heat resistant. The Silverton also features interior Velcro space dividers so you can organize the inside spaces as you prefer. And because it features a special 3-digit combination lock, you can be sure your stash is safe, secure, and discreet. Finally, the Silverton travel stash bag includes a handy metal cleaning poker and an activated bamboo-carbon, scent-absorbing OdorPax packet. A free mobile phone app cannabis log app is available to help you log dates, strains and experiences etc. If you intend to travel with your cannabis, always remember to keep it legal. You should only pack your travel stash bag and leave the house with no more than the legal personal quantity of cannabis allowed in your state. Airports in fully legal states (especially in the west) have recently announced that persons found with legal quantities of cannabis will not be detained, nor will their cannabis be confiscated. As always, check for details in your area and along your route before you travel. Crossing a border in a vehicle with cannabis is still technically a federal crime. Vehicles traveling out of fully legal states and into non-legal states are being pulled over on a regular basis. Don’t be one of those. If you travel into a state to buy cannabis, use it all there. If your living situation allows you the joy of total privacy, then you don’t have to worry much about protecting your stash from others. Which means, unlike nearly everyone else, you can choose whatever stash box design you like simply because it’s your favorite. And even though you typically have the home to yourself, you should still consider getting a weed stash box because you will occasionally have people or workers in your home to install or repair something. Very few people are alone 100% of the time. And even in states where cannabis is fully legal, and especially in states where it’s not, it’s always better to keep your stash out of sight. In a place that’s dark, cool and dry – oh, like a stash box. So in your situation, where you happily live alone, you can select from any of our stash box items that work with your decor and preferences, and then carefully pick out a spot to set it out on display. Perhaps you live alone but occasionally you have family staying over. If this sounds like your situation, ask yourself are your family members easy to have as guests? Mindful of boundaries? Polite? Or do you shudder to think about the last time they stayed over? Imagine how each of your friends and family would behave if they came into the room and saw a jar of fresh cannabis in the middle of your table. Would they walk past it with a smile, or would one of them be a problem? I mean yes, love your friends and family, yes – but know them. If you think there would be even one in the bunch who would walk off with the jar, or start reaching in and help themselves to your cannabis, or get angry just seeing it, then that’s all you need to know when deciding on best weed stash box for your situation. If that describes your family visits, then you need to get a box that will keep your stash hidden and locked up. Which box exactly you choose depends on what your how invasive your family is. Having read this far, you are now informed enough to decide. Just to illustrate, say you have a very hip, forward-thinking mom who’s staying over a few days. Say she’s totally cool and is someone you would actually discuss and share your cannabis with. Then the next week, say you have Aunt Ginny who hates the “heathen devil weed” marijuana. She arrives with her husband Uncle Jimmy who can’t ever seem to get enough of it. They’ll be staying at your place for a week along with their teen son who seems way too curious about all your things. In a situation like this, with an approving mom staying one week, followed by extended family upheaval, you need to plan for the worst possible outcome. Get a stash box that would completely lock down your cannabis. You need something that will protect it from being discovered by Aunt Ginny or raided by Uncle Jimmy or even the teen. The small metal safe comes to mind. Don’t be alarmed, it’s just a safe. Again, it wouldn’t matter if Auntie Gin-Gin found the safe while hanging clothes in your closet. And your stash is protected from anyone getting into it – looking at you Uncle Jimmy and teen cousin. In total contrast to the wildly different family members visiting, if you only have cool friends (and no minors) staying over, people who would never get to your stash, then you might actually have no real worst-case scenarios to consider. In that case, you can choose a stash box the way you might choose that nice jacket I mentioned. You can simply choose whichever one you like. That is how your worst-case scenario helps to choose the best weed stash box for your situation. Let your nightmare scenario point to the kind of stash box you need. Simply scan the situations described above to know what choices to make. I’ve talked at length here about what makes a good “hide-in-plain-sight” weed stash box. So I’d like to touch on some ideas that I don’t think work very well. First, anything you’re trying to hide should do nothing to attract attention. It should not look new, or colorful, or shiny, or valuable in any way. A disguise works best when it repels attention by looking old, uninteresting or to have no value. In fact, the more old, dusty, and uninteresting it looks, the better. The key is that no one would ever be drawn to it – they should never want to reach for it and pick it up. I’ve seen items that look like clever places to hide valuables. Such things as soda cans with a screw-open bottom and are big enough for a wad of cash etc. At first, that seems like a very cool idea. And it works until someone who’s thirsty sees the can. Then they pick it up and realize that although it’s sealed, it has no weight. Then they get curious, look closer and start playing with it and “boom,” your stash has just been discovered – all because the container attracted their attention. You’ll find the same holds true for all the other product-as-stash-container ideas that someone might reach for. I’ve seen this approach to stash containers show up as various cans or jars of foods or drinks. I’ve even seen containers as cans of shaving creams, motor oil, household soaps and cleansers, toiletries etc. People use these things and shop for them all the time. And by using any of these containers as a disguise for your stash, you risk someone reaching for it. So if you’re serious about hiding your stash of cannabis, don’t keep in a container that looks new. You should keep it in something that looks old, uninteresting, totally blends in and won’t attract any attention. Truth be told, if you’re crafty, clever enough and good with your hands, you can certainly fashion a stash container yourself. Just think about your living situation. Then review what kind of weed stash box I paired with the situations I illustrated above. Then make your choices based on that. But if you just don’t have the time, I’d love it if you picked something from our line of stash boxes and bags. Because unlike our boxes, we’re not in disguise. We have something to sell and we hope you like it enough to buy. Because that my friends, is how we survive to thrive. Please leave a comment below – I’d love to hear from you! Tell me about your situation and what kind of issues you’ve had trying to keep your cannabis safe.